This morning I went to vote holding a roll of toilet paper. I had to explain that it was not a political statement, but I had run out of tissues. I had to explain that wasn’t a political statement either, just a bad case of running nose. Yet around there were several faces looking like they could use a kleenex and not because of a cold. 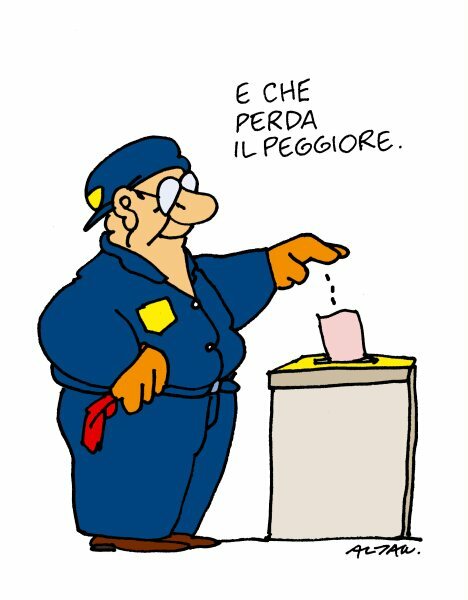 More than for any other Italian election (and that’s something) I hear of people going to the ballot place with a sinking heart and not coming back much relieved. Many are not going altogether. But you don’t want to hear about that, the Guardian has already explained Italian politics superficially enough and that’s all you need to know. Foreign newspapers seem to be unusually interested in the Italian elections this round, media attention from abroad inversely proportional to the locals' enthusiasm. I have the impression that we were much more taken by the US elections than by our own, no wonder. It’s nothing new for Italians to go to the ballot box only so that the worst-man may lose (which seldom happens anyway). So much for hope. And yet, one thing these elections managed to do for me is surprise me. I am not talking about the outcome, that can hardly be surprising, I am talking about people. Berlusconi has been in power in this country for most of my adult life so far and yet I only know a handful of people who voted for him and even less who admitted doing so. Well, that’s obvious, I’ve always thought, we tend to hang out with people holding opinions similar to our own. As the electoral campaign trickled down Facebook posts in the past few months, I was genuinely flabbergasted by how many of my Facebook friends were going to vote for Beppe Grillo. The shock was such that I hardly had the stamina to react. You may want to turn elsewhere for a socio-political analysis of Movimento 5 Stelle, and if you can read Italian I recommend the analysis by the writers’ collective Wu Ming on how to tell the left from the right. My point here is that I would have never expected that, out of the blue, I’d disagree so profoundly with so many people I know. Emma Goldman said that if voting changed anything they would make it illegal. I actually think it is true, but I’d amend my personal version to: if voting changed anything for better they would make it illegal. The problem is that voting, and NOT voting, can change things for worse. So I went out this morning, armed with a roll of toilet paper. Blew my nose and clamped it tight and voted so that the worst-MEN may lose.